Leicester City owner Vichai Srivaddhanaprabha was in a helicopter that crashed outside the football club’s King Power Stadium after an English Premier League match against West Ham United, the BBC has been told. Also on board was one of Vichai’s two daughters, two pilots and a fifth person whose identity was not immediately confirmed, together with the Thai billionaire, a source close to the family told the BBC. The incident occurred in the club’s car park, where police cars and emergency services rushed towards an area where flames were clearly visible before the area was evacuated. Danish World Cup keeper Schmeichel was reported to be in tears as he watched the inferno. It took more than 20 minutes for the flames to be extinguished before emergency services were able to survey the wreckage. “We are dealing with an incident in the vicinity of the King Power Stadium. Emergency services are aware and dealing,” Leicestershire Police said. 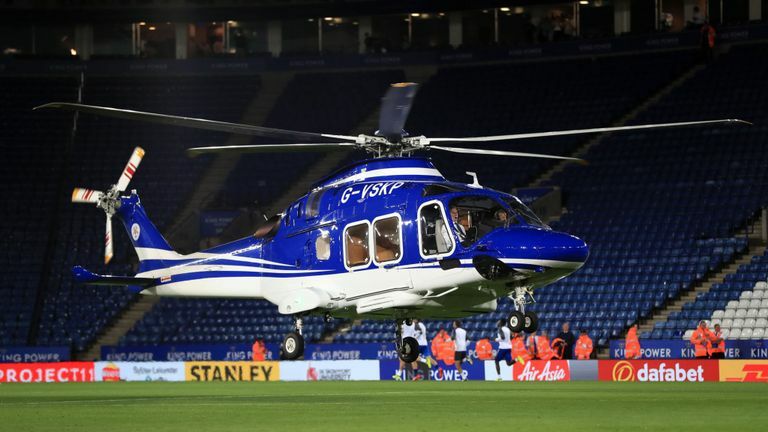 Srivaddhanaprabha routinely leaves the stadium in his helicopter, which lands in the centre circle on the pitch, after every Leicester home game. It was not yet known who was in the helicopter.